Sega may be a name that many people readily associate with videogame brilliance, but when you seriously think about it, they've only really had one universally successful machine - the Mega Drive (Genesis to our American readers). The Saturn and Dreamcast may have garnered critical support but they died a sad, painful death at retail and the 8-bit Master System was virtually ignored outside of Europe. It's hard to deny that much of Sega's reputation is down to the classic 16-bit console and the wide range of quality software released for it. Released in Japan in 1988, the sleek black 16-bit powerhouse got off to something of a slow start. Squaring up against the dominance of Nintendo's 8-bit Famicom and the rapidly emerging PC Engine from NEC (released a year earlier), Sega's new console initially struggled to find a place in the Japanese market. However, thanks to some superb conversions of hit arcade titles like Golden Axe, Ghouls 'n' Ghosts and Super Monaco GP, it started to carve out a respectable niche in the sales charts. However, it's worth noting that at this point the Mega Drive was not seen as a massive success for the company. That would have to wait for the US release of the machine. The story was a similar one Stateside - Nintendo were the company to beat. Due to a copyright issue regarding the name 'Mega Drive' (and not because Sega hoped to attract Phil Collins fans), the name of the console was changed to 'Genesis'. Sega of America were far more ruthless than Sega of Japan and the early adverts attacked the rival company, boasting that 'Genesis does what Nintendon't'. The machine was aimed at gamers that had grown up with the NES and now wanted something more edgy and 'cool'. The combination of high-profile arcade conversions and heavily licensed sports titles helped Sega win a massive slice of the US videogame market, and the Genesis successfully saw off the rather limp challenge of the Turbografx (the American version of the previously mentioned PC Engine). The European launch of the console also went according to plan and it wasn't until Nintendo unleashed their 16-bit 'Super' Nintendo console that the Sega had anything to worry about. Even then, they amazed skeptics by going toe-to-toe with Nintendo - something that during the NES era would have been virtually unthinkable. Much of this success was down to one thing - Sonic the Hedgehog. Sega knew that they needed a mascot to boost the profile of both the company and the Mega Drive (monkey-boy Alex Kidd was the previous choice, but he had faltered in the face of Nintendo's Mario). The answer was a blue hedgehog named Sonic. Faster than a speeding bullet, he quickly entered the hearts and minds of gamers worldwide and for a short while became the face of videogames, pushing the decidedly 'uncool' Mario into second place. 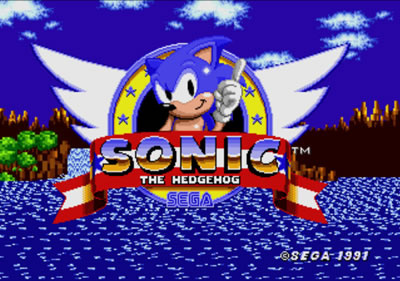 The high point was undoubtedly the release of the second Sonic game, which was shipped worldwide on what came to be known as 'Sonic Twos-day'. Yes, it was on a Tuesday, in case you were wondering. Of course, the console enjoyed other hit titles too. Although it could be argued that the SNES had more 3rd party support and a better range of software, the Mega Drive seemed to be made with a different kind of gamer in mind. Titles like Gunstar Heroes, Comix Zone, Streets of Rage 2, Alien Soldier, Ranger X, Thunderforce IV and Revenge of Shinobi had a different edge to them when compared to the output found on Nintendo's machines. Although the Mega Drive was in many ways technically inferior to the rival SNES, with less colourful graphics and crude sound capabilities, it did boast a faster CPU and this allowed for some frantic and action packed games. The system was flooded with brilliant 2D shooters, whereas Nintendo's console (produced with a slower CPU in order to keep costs down) catered for more sedate experiences, like platformers and RPGs. Thankfully the market was big enough to contain both machines and a spirited rivalry appeared that has seldom been experienced since. 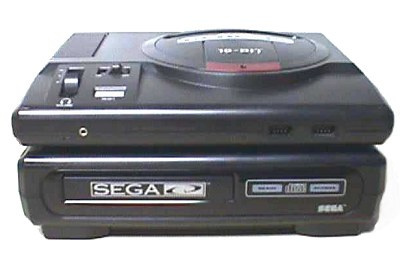 Sega later augmented the power of the Mega Drive with some ill-fated peripherals - the Mega CD (released in the States as the Sega CD) and the 32X. Although there were highlights (such as an excellent home port of Capcom's Final Fight on the Mega CD and Star Wars Arcade on the 32X) these two catastrophic add-ons did much to damage public opinion and consequently many gamers turned away from Sega when they announced the 32-bit Saturn. Thankfully, lucky Wii owners can gloss over the bad times and enjoy the games that made the Mega Drive so great. You know, I have yet to see any third party Sega Genesis games. I for one would like to see Konami release the likes of Contra: Hard Corps, Castlevania: Bloodlines, TMNT: Hyperstone Heist. I know there are many more third party Genesis games I'm leaving out, but can't think of any more right now. I never had a megadrive because I was lucky enough to win a master system 2 before they were released in a competition. Therefore most of the megadrive releases I have never played which is kind of good if I want something old but new. I was just wondering if there are any rumours of any master system games coming out on vc because I have fond memories of the master system sonics and alex the kidd. When I downloaded the megadrive sonic I was suprised it was so different from the master system version, they are literally 2 different games. Slogans like: "Genesis does what nintendont" makes me sick. I owned my genesis for a long time now and maybe i just didn't play enough good games for it. But i know that the SNES had better mario/zelda/metroid quality games and not the rushed sonic ones. and because nintendo was focused on what they wanted to do and not throw in add-ons, and thus why they prevailed. Kenjara - I doubt Master System support will be introduced to the Virtual console, the machine simply wasn't successful enough in the US and Japan to justify it. They might add it to the Euro VC, but I wouldn't hold your breath! Shrapnel - The original Genesis/MD pad has three facia buttons and one start button. The NES pad has two facia buttons, a select and start button. Although you're quite right in saying they have the same number of buttons, the NES pad never really made use of the select button during gameplay, whereas most MD games supported all three facia buttons. The MD six button pad, released when Street Fighter II came out, IMO ranks as one of the best controllers ever, even beating the SNES pad. As for the Genny being overrated - well that's a matter of opinion. For me, the machine will always have a special place in my heart. It did feel 'cool' at the time to be playing cutting edge arcade releases when the rest of your friends were still struggling with crappy brown NES visuals. Sega have always had a reputation for action packed titles thanks to their arcade heritage, and the MD is one of the machines that confirmed that. is there any chance of the master system being added to VC? the original Alex Kidd and Sonic ruled. I was raised in a Nintendo House hold until the PS2 was released and even that was replaced quickly by my interest in the XBOX. I'm 20 years old and I remember arguing Nintendo vs Sega when I was just a little feller. Although I lacked desire to play the Sega, Sonic was always something you wish you had. A top selling title not available for my machines that half of the kids were talking about, Mario was never anything to talk about - if you talked about Mario from 1988 - 1992 it usually meant Mario Bros was your only video game. Comparing the Genesis to the Super Nintendo is difficult, as stated above the Genesis processor and games were a little better, where as the graphics in the Super Nintendo had the potential to blow it away. Unfortunately, the debate back then was hardly the graphics seeings how resolution was a non existent topic. Game play was what it was all about and the Sega games felt rushed. I'm completely Bias, the debate is almost identical to xbox versus PS2. One console has great graphics, the other console has an abundance of games being released both aimed towards different style of players. I had megadrive owning friends (come on, you were either sega or nintendo in those days) played sonic and golden axe and what have you, but never felt like I was missing out. Saturn on the VC would be nice. I want Guardian Hero's, and Nights, that'd make me happy. If this NiGHTS sequel on the Wii thing ever pans out, then I think getting Saturn games on the VC would be a logical move. So hopefully we'll see some of those high quality saturn games on the Wii. After all, even if there isn't a particularly huge library for the Saturn to port over, it's not like it requires much extra funding to introduce a new console onto the VC. I'd say its probably inevitable that we'll be seeing Saturn games (I'm looking at you NiGHTS and Sonic CD!) pop up at some point. I would have to agree with Zee tho, i mean, the wii has only been out since December (or Nov in US, lucky so-and-so's) and already 2 new consoles have been announced for VC its only a matter of time before others follow suit and given Sega's strong support for the project (and nintendo in general atm) it does seem highly likely that Saturn games will rub shoulders with those of the 64 on Wii! Nice article, do you ever think the Dreamcast will make it's way onto the Virtual Console? Wasn't it the approximate equivalent of the N64? Would be nice to get the original Soul Calibur on it, and also NFL Blitz 2000. Loved that game. The Dreamcast was a generation ahead of the N64 so it's hard to say if the Wii could handle the emulation, but there's a chance I suppose! When the best of current crop of machines is available on the VC I'm willing to bet Nintendo will look at moving on to other formats, but I would imagine the Saturn will be first Sega console in line. Of course, there's the issue of download size - as soon as you start talking about having CD-based consoles on the VC, the size of each game is going to skyrocket. It will be interesting to see how Nintendo handle this issue. hmm the sega saturn theres only two games that come into my mind when thinking of that console. Daytona and diehard arcade? (the 2 player coop one). Wouldnt mind seeing them on vc because I used to play them with my neighbour. The Mega Drive, "universally successful"? How about it being pretty much a total flop in Japan? Not to mention it being capability-wise more behind its rivals than other Sega machines. I'm a pretty big Sega fan but honestly I'd say the Mega Drive was the worst Sega system. Its OK and all, but the SFC and PC Engine bested it utterly. The Saturn is probably my favorite system ever, and the DC...I think that's may favorite system ever too. The MD was just a nice looking console with hella brown graphics and lame sound. True, the machine wasn't a massive success in Japan but it was hardly a 'total flop' either. In terms of power, I don't see how it was 'more behind' rival machines, either. The Megadrive was capable of some amazing tricks, as games like Thunderforce IV, Gunstar Heroes and Alien Soldier show - stuff that the SNES would be hard pushed to replicate. As for the PCE and SNES being better, well that's your personal opinion, isn't it? Please don't fall into the trap that most fanboys seem to - thinking they're right and everyone else is wrong, just because they say so. Anyway, check the worldwide sales figures and I think you will find that the Megadrive/Genesis is Sega's best-selling (hence most 'universally successful') console. "universally successful" doesnt say anything about the machines quality. Tamagochis were universally successful and they broke as often as they worked. 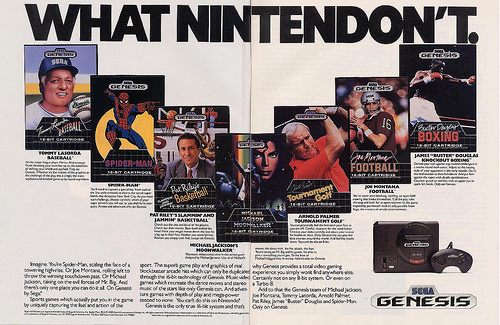 What put the MD head and shoulders above the SNES was Sega's marketing department! In Britain at least, not only did the sega ads make it "kewl" to own a MD but they made "uncool" to think about getting a SNES (to a certain extent this was a problem suffered from llllooonnngggg into the Playstation generation). When i got my SNES i was a definite oddity in the area, to a person, they all had megadrives. Sega is one of the best systems.. 689,567,454.06 thumbs up!!! The mega drive 2. anyone have one? the black one with the red buttons. I had the original model with the volume thing on the front but my point is why call the revamped design console the mega drive 2 when all they did was change the shape? Nintendo DS, Nintendo DS Lite. Playstation, PSOne. GBA, GBA SP. Clearly sega were't ahead of their times when it came to changing the name slightly. The Sega Saturn should have been called the mega drive 2 and a lot more sales would have been made in my opinion. I have to disagree that the Mega CD was a dead end add on... many of my favourite games came out for that system such as Eternal Champions, Final Fight, Keio, Thunderhawk, and most of all, Lunar 2, Dune and Snatcher! You can't mention Sega's marketing without mentioning "blast processing." Remember two vehicles with a TV in each one, one showing Sonic blazing by and the other showing Mario poking along? And then the Sega car would take off, while the Nintendo car would barely putt along? And you can't forget the Sega scream, either! Sega's marketing in the early '90s was brilliant, and it was painful to see the way they completely bunked up advertising for both the Saturn and the Dreamcast in the years to follow. Sega made some iffy hardware decisions on both those consoles and some stupid launch decisions, but they could've overcome those factors had they been able to harness the marketing magic that they had in the Genesis era. I won't lie, their marketing made me lust after Sonic. But other than that, most of the games I wanted to play were available on the SNES. In the end, Sonic wasn't nearly the landmark series (gameplay-wise) that Super Mario Bros was, so I really felt like I didn't miss out on much (and now I get to play them all I want on VC), but at the time it was practically torture. The 16-bit era was a golden age for fanboys, but what it really boils down to is that it was a great time for gaming. No matter what the opinions, both machines were great consoles and both had tons of great games on them. I never knew anyone that was dissatisfied with owning either console. I wish that I could be so enthused about a current console that I would feel the need to get into such heated debates again. The Genesis played an important role in gaming history and really helped to show the benefit of competition. Think we'll see the 32X? Games should still cost the same as they do regular Genesis games I think. the ONLY game i want from the Genesis add-ons is Sonic CD. THAT was a great game. I could care less about the 32X, but I'd love to see Sega CD games eventually debut on the service, as I'd love to play Sonic CD and Snatcher, and to see just how horrible Night Trap truly is! We need the Sega Saturn and Dreamcast on VC NOW!!!! Only if there is a solution to the storage issue. Will Sega Saturn and Sega CD be in the virtual console?? ?